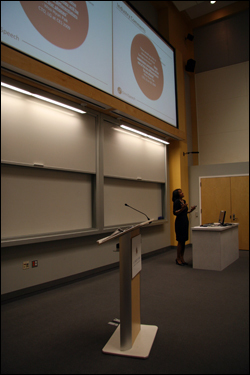 Professor Carol Espy-Wilson pitches the Omnispeech plan at the competition. Professor Carol Espy-Wilson (ECE/ISR) and Tarun Pruthi, a research associate in the Department of Electrical and Computer Engineering, won the “High Technology Category” of the 2010 University of Maryland $75K Business Plan Competition. The annual event is hosted by Mtech, the Maryland Technology Enterprise Institute. Espy-Wilson and Pruthi won a $40,000 prize for Omnispeech LLC, a start-up company that has developed a speech extraction technology for voice communications. The technology addresses a problem familiar to anyone who has used a cell phone in a public place: background noise. The novel algorithm "cleans up" speech by separating the voices of the primary speakers from their noisy environments. It additionally can be used to improve sound quality in hearing aids, for military sniper and subject identification, and in teleconferencing. The technology behind Omnispeech also won the university's 2010 "Invention of the Year Award." The business plan competition promotes the commercialization of innovative ideas and university-created technologies by offering faculty and students prizes for the best new venture plans. It is part of “Business Competitions Day,” organized by Mtech and the Dingman Center for Entrepreneurship.